I have loved infrared B/W photography ever since I discovered it in college. Especially when I photograph trees. Once I started shooting digitally, I created a “similar to infrared” action in Photoshop. 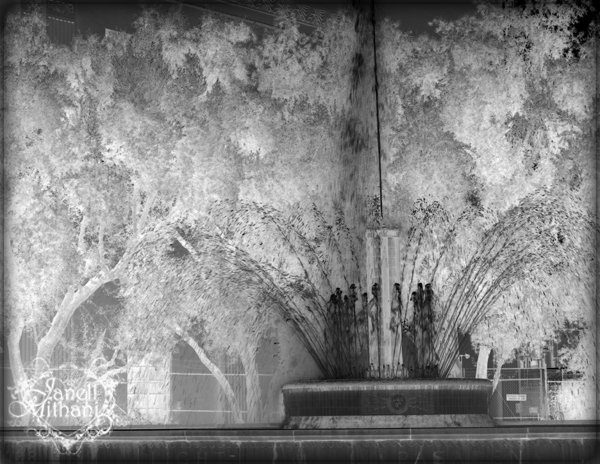 This is a shot of a fountain surrounded by trees. I took it a few years ago when I was on location, photographing an engagement session. Anybody else a fan of infrared B/W photography? This entry was posted in Art and tagged art, B/W, infrared, photography. Bookmark the permalink. This is amazing, I love it and I just got a fan for this type of photography. Thank you for sharing this new medium! Really crazy..but I like it! !